It's easy to get distracted. Screens call out to us everywhere. Even a once peaceful wait in a reception area is now punctuated by a wide-screen TV. Heads down, we miss opportunities. Eyes locked on a screen, we miss the people around us. That screen might spark a little creativity in you but most of the time it might also be standing in the way. Let your mind wander. Pay attention to your surroundings. Let nature spark a little creativity in you. Flow with that creativity and give it your full attention. Not just a second, not just a moment, but your full attention. Creative notions have a habit of dissipating if we don't focus on them, pay attention to them, keep them alive. 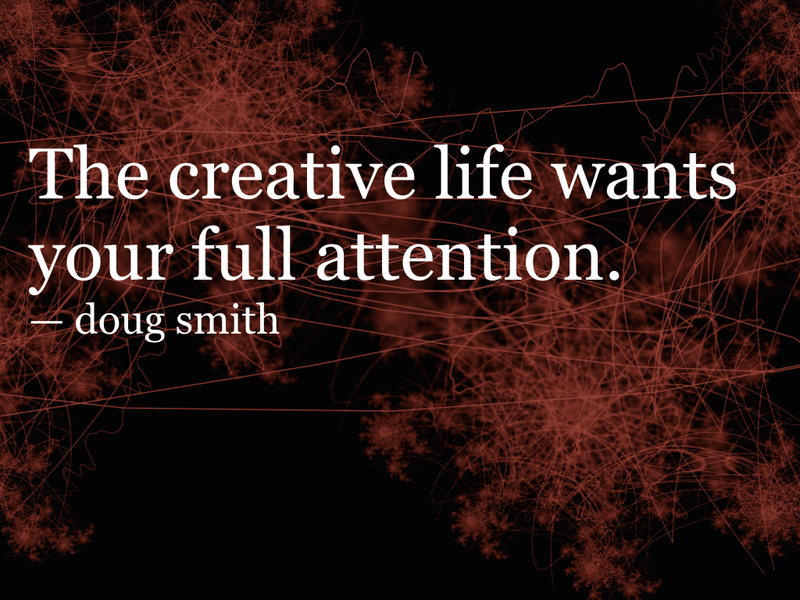 The creative life is not a part-time creative swipe. The creative life is rich, deep, and full AND very jealous of screen time. It would rather have you spend time being creative. 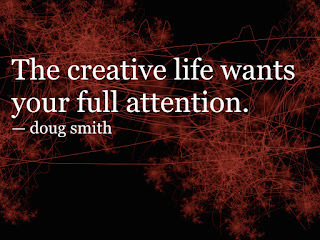 The creative life wants your full attention. Take a walk. Leave your phone at home. Breathe. Let your mind wander. Write, by hand, for at least twenty minutes. If necessary to avoid distraction, leave your phone in another room. Keep a small sketch pad nearby and when you get bored the next time instead of picking up your phone, doodle a sketch. It doesn't matter if its any good -- it's a doodle. Happy creative life -- you deserve it!